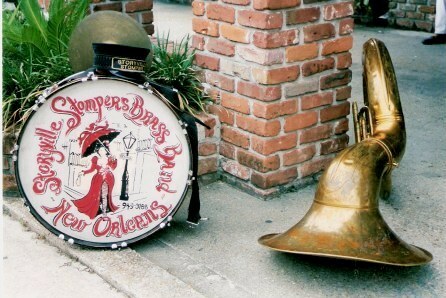 Go to New Orleans and immerse yourself there. the music of your life has not gone. if you listen to it, you can play it. Sometimes – being surrounded by the music of others helps you find the song in your own heart that may have been tucked away within you – kept safely for the time to remember it. When I say music, I mean that both in a metaphorical sense, relating to the lost song of your youth when all things were possible and days were sweet with the enjoyment of just ‘being’ somewhere, as well as meaning it literally as the actual music you can hear. 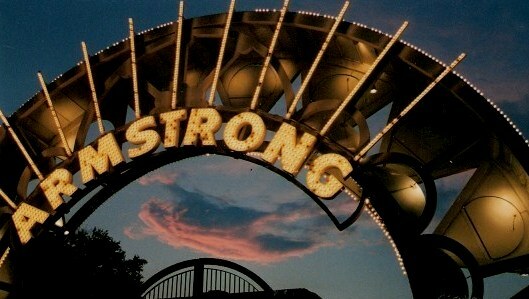 Armstrong Park celebrates Louis Armstrong, who came from the Tremé (pronounced Tre-may) neighbourhood as a poor child to become a world-wide jazz music icon, and New Orleans’s most famous son. This much photographed arch is a sort of symbolic gateway – but the performers of New Orleans are more widely to be found… and not just within the many music bars and restaurants. Don’t stay on Bourbon Street and think you’ve seen the French Quarter, or that you have experienced New Orleans . There is far more to the city than what you can see there. Leave the 'drunk and behaving badly' visitors there and find the heart and soul of the place. 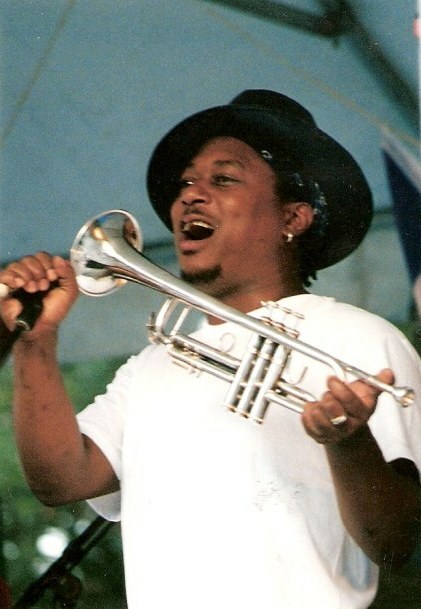 It might be at one of the many festivals with their outside stages, like this one with another of the Tremé sons, Kermit Ruffins, performing with the Barbeque Swingers – his jazz quintet. The band is named for the frequency with which a barbeque accompanies Kermit’s performances, and a New Orleans Barbeque is something done on grand scale. We were Kermit regulars. The sound is contagious – and Kermit has a totally New Orleans “How d’ya like me so far” type of attitude that says: 'This is me. Take me as you find me'. Kermit is no longer regularly to be seen at Vaughans on Thursday night, but is now at the (in)famous Mother-inLaw's Lounge that he bought and brought back to life. We used to take a cab to get to Vaughans in time for some bbq. I hear from friends it is even better attended than before Katrina. You can cool off after dancing by perching on the window ledges outside – where my friends and I were once recruited to dance for a video Kermit was making – he singing on the bar and we dancing below him. It was my birthday and the first time I ever drank good vodka over ice. The rest is self-explanatory – great dancing – clear head the next day (by the miracle of fine quality vodka). 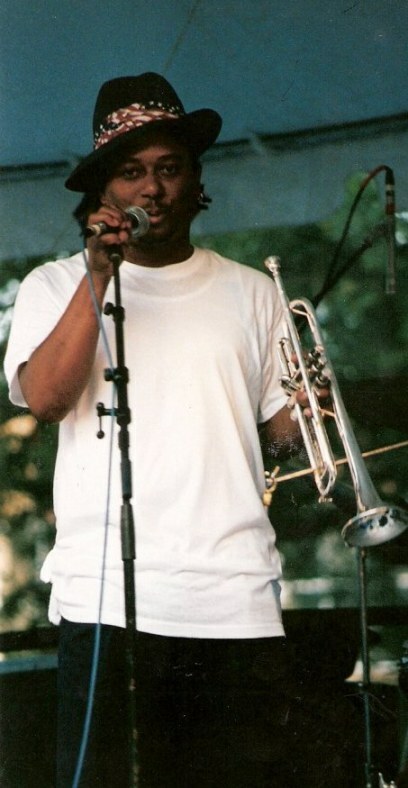 New Orleans music is not all jazz - and a walk down Frenchman’s Street was always something that consolidated that fact – for you could walk along from bar to bar, your drink in a plastic “go cup” and hear a wide range of music styles. Where in the world would you find a music venue inside a Bowling Alley? Where in the world would you find a Laundromat, Pool Hall and Bar all together? The first is the Rockin Bowl and the second is Lucky’s Bar, Grill and Laundromat. Both great places to experience – not just to go to! I only ever went to Vaughans after about 1:30a.m. when I came directly from dancing Zydeco at The Rockin' Bowl. The Rockin Bowl (officially MidCity Lanes) on South Carrollton is another cab ride away and its re-opening was a symbol of the spirit of New Orleans following Hurricane Katrina. Fortunately most of it is on the first floor (second floor, if you are American – or to clarify - the first floor above the ground!) so much of it was saved from the floodwaters. When it re-opened, the city was in total disarray and in darkness all the way to the waterfront from Carrollton– even on the Interstate Highway that runs beside it. A special license had to be sought to allow it to open – with special arrangements. That night, when a lone neon Bowling Pin illuminated the night of a tattered and torn section of town, over seven hundred people came to show their defiance of the odds and to hear music and dance. I used to go there to dance zydeco – which somehow just seemed to adopt me as a dance – as much as I did it. 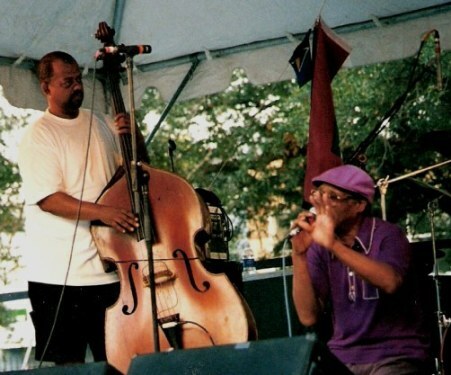 Rockin Dopsie Jr and the Zydeco Twisters were always a favourite. When they performed Dopsie Jr used to roam about at the doors welcoming people – and a very acceptable sight he and his brothers are as a welcome – as any woman can see. Speaking of barbeque - I remember many nights at Donna’s Bar and Grill on Rampart- not far from the Armstrong arch, sadly no longer operating. By the way – Bob French lost everything but his two sets of drums in Hurricane Katrina so if you buy CD it would help! If you want to do some living before you die, do it in New Orleans. If you cannot go in person, imerse yourself in its atmosphere through its music.